February is upon us, and as we prepare for Valentine’s Day and brave the cold and snow in some parts of the world, we have questions that need to be posed! And who are we asking questions of you ask? and is a contributor to the Peculiar Ramblings newsletter. But wait!!! 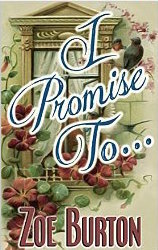 Zoe is offering one e-book of I Promise to… as a giveaway! Usual rules apply – Every person who submits a question gets one chance entered into the pot. If you submit a questions and comment on the final interview you get two chances! I hope everyone will welcome Zoe with a question or two! All questions must be submitted by Friday, 6 February. The final interview will be posted Monday, 9 February. Final comments to be entered into the drawing Wednesday, 11 February. Winner will be announced Friday, 13 February. Someone will have good luck on the Friday the 13th! Leave me your questions in the comments below or message to me on Facebook! I loved your book,I Promise To. I found the characters of Darcy & Elizabeth very tender and loved them. Are you working on another story? If so, can you tell us a little about it? Can’t wait to read any and all future books from you! Cat – it is a shame that none of the current NASCAR men look like David G. Not even close! I bet that Miss Zoe could write a tall, dark, and handsome driver. What do you think? I have read Leslie’s novels but never Zoe’s. This question is for Zoe and Leslie. When did you first get interested in Jane Austen’s characters and who was inspiring you besides Jane Austen and the characters? Hi, MaryAnnN! I’ll answer yours here, so I don’t crowd in on Zoe’s interview. I was first introduced to Jane Austen by my mother. We rented the Emma Thompson version of Sense and Sensibility, and while Fanny Dashwood wheedles her husband into giving no help to his sisters, my mom giggled at the portrayal. I asked her for the book soon after, but I didn’t read it for a few years. I ended up reading Pride and Prejudice first and loved the story and characters. I remember continuing the story in my head so many times, but that was way before I found JAFF. So, her work has always inspired me. It was simply having the right push to write something down. After that, there are a lot of things that can inspire a story. For R&R, it was simply the idea of Elizabeth being forced to accept Mr. Collins that set me down the track. A Matter of Chance has a lot more of me in it. I have bits from my art world, my children, my friends. I have started Sources of Inspiration here to show some of the things that I use to inspire me or where I get bits for my stories–names, buildings, etc. Thanks for the questions for me and Zoe! You are quite welcome and I loved your books! Thanks again for a great adventure with characters I loved since childhood along with my favorite author. I read constantly as a child and only lived a block from the library so I had access. Now I have 3 bookcases full of P & P and their variations. I now have an e-reader so since I had no more shelves, they go into the e-reader with all the books I purchase. Being a retired Rn for many years, I have time to read! Your favourite author? You flatter me! Seriously, that is a huge compliment, thank you! Sorry to dissapoint you but Jane Austen is my favorite author. Sorry you misunderstood me but you are right up there along with Joana Starnes, Sharon Lathan, Regina Jeffers, Abigail Reynolds, Alexa Adams, Linda Wells, Linda Berdoll. P.O. Dixon and all the rest. If I had to pick one I like the best of the P & P writers, I couldn’t. You all have a different style, approach, etc and that makes each of you special in your own way. I have read from all the authors and don’t mean to neglect any but my mind didn’t bring them all back to me. I nearly forgot that I am waiting for Marsha Altman’s last book in her series and I loved them all so far. Rebecca Collins also did a great job with her series. Believe you me when I said I have read them all. Not bad for a almost 78 year old. Thank you ladies for the great ride and I will continue to read your novels! Anyway, I am flattered to be ranked with such illustrious company. Thanks, MaryAnnN! 1) If Fitzwilliam Darcy was to cut in front of Matt Kenseth on the final lap at Daytona, would you still love Darcy? 3) Since you are a fulltime teacher, how do you find time to write? 4) (see question #3) What is your greatest sacrifice to use your extra time writing? 5) What drew you to Jane Austen fan fiction? 6) When is your next book due to be published? 7) If Matt Kenseth was to cut in front of Fitzwilliam Darcy on the final lap at Daytona, would you still love Matt? Me too, Leenie B. “Enquiring” minds want to know! Eeek! I was having some kind of posting issue, so hopefully this doesn’t show up several times. Do you have a character you love to hate? And does it remind you of anyone in real life? (You don’t need to give names but if you hate Caroline, maybe she reminds you of all the catty girls from high school, for example). What inspired you to write this version of P&P? In the blurb, it mentioned if the arrange marriage happened will it keep her safe from a member of the peer… Is the peer you speak of someone in Elizabeth’s circle or more of Darcy’s circle or even someone titled? First let me say that I appreciate your having me here. I have been addicted to Jane Austen since grade school ( I am now 67). I Jane Austen Fan Fiction immensely. I do have trouble when reading sometimes. I always have anywhere from4 to 6 books going at once. I am always reading so there is something to read next to me all the time.I handle that quite well. The exception is this. If I have a Regency era novel going and a modern one at the same time. I sometimes find myself having to stop intermittently and think the storyline and get myself back into the proper era. Lol My mullti tasking self ( whick is quite competent normally) needs a reboot so to speak. How as a writer do you manage to train your thoughts to do that? I do remember and keep the comprehension but have to stop and take a breath more often. Feel free to continue to leave Zoe or me messages or comments, however, the call for questions is closed. Thanks everyone for your awesome participation this month! See you on Monday when I post Zoe’s responses.